Jacob Paulsen is out at Shot Show 2019 talking with Lee from Allen Company, a Colorado based business which manufactures a number of products involving firearm storage. They produce many different styles of quality cases for rifles, shotguns, pistols, compound and crossbows. Their latest innovation is a method of storing firearms in a more discreet, more secure manner then tradition cases. At Shot Show 2019, Allen Company introduced 3 new products in their Gun Closet Line. One of the best features about the Under the Bed Locker is the grab handle. This allows the bag to be staged in a way that the bag and your home defense weapon is easily accessible when you need to get to it quickly. “I like to place them (firearms) in a spot where they won’t get dinged up and they’re organized nicely. But if something goes bump in the night or there’s a strange knock on the door at night and I roll out of bed quickly I want to be able to hop out, grab the handle on the end, pull this thing (Under the Bed Locker) out from underneath the bed, zip it open and there they (home defense gun) and (off) I go. Being lockable means a safer way to store your guns under a bed in a home with children. Don’t be the person who thinks their kids don’t know where everything in their home is. They do. The UTV is for transporting your collection of pistols. Multiple holsters and straps in the medium sized bag allow for secure organization for up to 4 pistols. Included is an area dedicated to magazine organization with straps and pouches for securing spares. Also included within the UTV are hook and loop closable pockets for miscellaneous gear/ammo. Patterned after a garment bag for a discreet appearance, the Closet Hanger is Jacobs favorite of the three. As the name implies it’s intended to hang inside a closet. Not only does the incognito look help to hide your guns in plain sight, but thieves might not be expecting your firearms to be hanging in amongst your pants and shirts. The cases produced by Allen are lockable, helping to keep your weapons secure when transporting. It’s not uncommon for criminals to lurk around gun ranges and steal weapons out of unlocked vehicles. 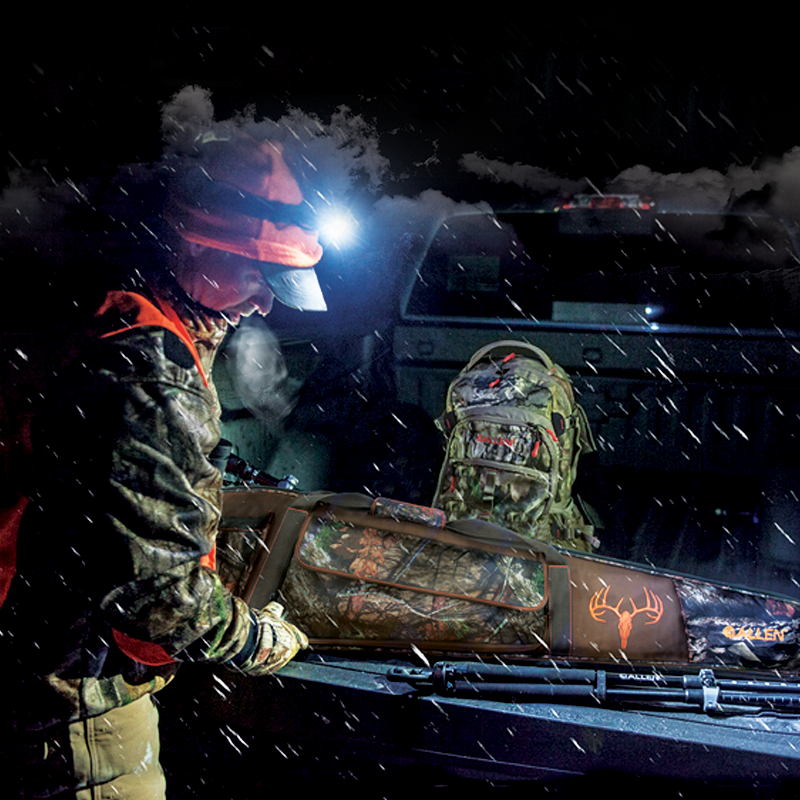 Keeping you guns in a lockable case helps prevent them from walking off. Depending on the range you’re at, you might be able to hang the case up and have quick organized access to all your guns, mags and range gear. Looking for a better way to organize your messy gun safe? Hang one of these up inside to help minimize the clutter. Without a doubt, a purpose built and properly installed gun safe is the most secure way to store your firearms. But if space or finances limit your ability to do so, this might be a good option for you. And you have the chance to get one for free. Allen Company decided to give Concealedcarry.com, nineteen (19) Gun Closet cases to give away. The giveaway winners will be announced live from Concealedcarry.com Facebook, on Friday, February 1, 2019. The 19 winners can then choose of any one case from the Gun Closet series firearm storage. Interested? Go to www.concealedcarry.com/allen19 to signup. If you don’t win a case from Allen Company, but still want one, the Gun Closet Line’s perfectly affordable price is between $79-$99.